I’m not sure how the ritual started, but when I was nine and my sister, Danielle, was seven, we would wake up every morning at five to make buttermilk pancakes from scratch for Dad’s breakfast (he was the early riser since he had to be to work by seven). We were total “Daddy’s girls” and loved to do anything that pleased him, but we especially loved to make him buttermilk pancakes because we also got to reap the delicious rewards of our efforts. By the time Dad came down from his bath in his mailman uniform, smelling like Old Spice, we had a big plate full of pancakes and coffee ready, and if we were really on the ball we’d have scrambled eggs cooked up too. 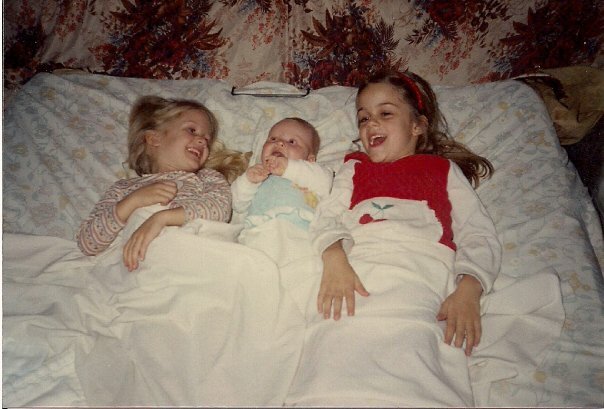 I still can smell the combination of pancakes, butter, coffee and Old Spice surrounding me as we sat down with Dad and gleefully tore into the butter and syrup-laden pancakes, trying to keep our voices down while Mom and our little sister, Lacey, slept peacefully upstairs. Eventually the thrill of eating those “forbidden fruit” pancakes wore off and was no longer enough of an incentive to get us out of bed before dawn. The daily ritual eventually diminished to once a week and then once a month, but it lasted for years. By the time I was in high school, pancakes were a special Sunday breakfast that we only indulged in a few times a year and I haven’t seen that old stained buttermilk pancakes recipe that we cut out from the back of a flour sack since I left home over a decade ago. That recipe somehow got lost without me there to use it, however infrequently, and I was left slightly unsatisfied with the pancakes I’ve made since then. Well, the “Best Buttermilk Pancakes” were really good, but not fluffy like my favorite childhood pancakes. 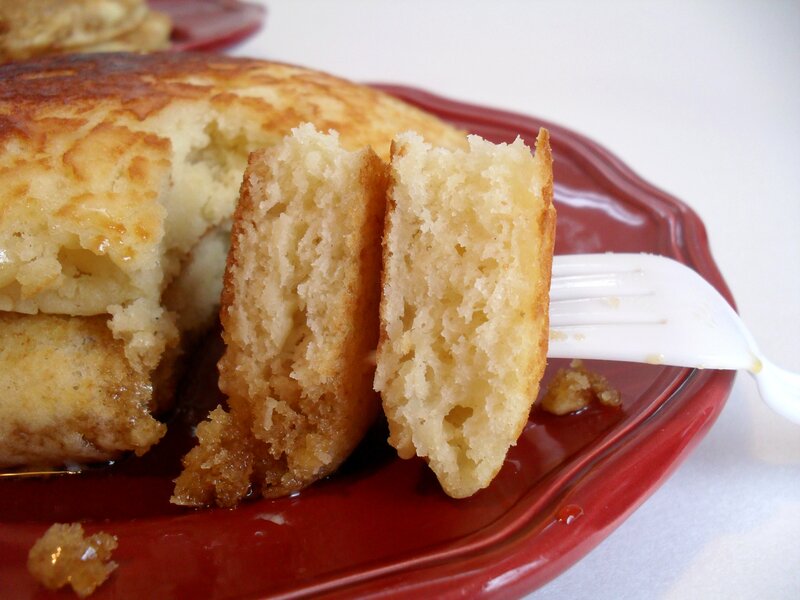 These pancakes are the closest thing I’ve had to those I made growing up since I’ve left home–wonderfully soft and fluffy with just a hint of sweetness. Mix dry ingredients together in medium bowl. Add all wet ingredients at once and stir just until combined. Do not over mix, batter will be slightly lumpy. Lightly coat skillet with oil. Heat to medium low. Drop 1/8 cup of batter onto heated skillet. Cook on first side until bubbles begin to form on surface, 2-3 minutes. Flip over and cook another 2-3 minutes until golden brown and centre springs back when lightly touched. Serve warm with maple syrup and butter. Makes 10-12 pancakes. 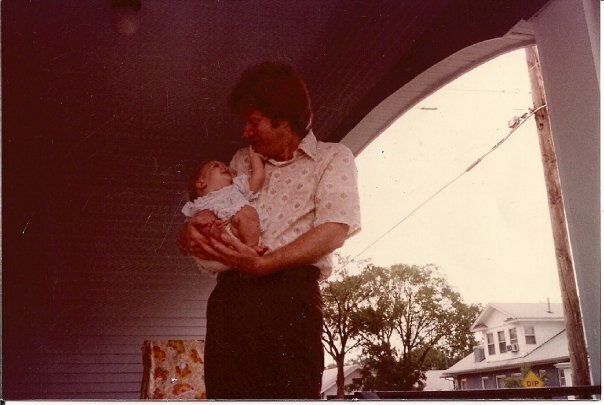 Most of the pictures taken of us growing up remain at my parents’ house, but I thought I’d include a few that I do have here. Danielle, Franciska (aka Lacey) and Me on the fold-out couch we slept on until we moved into a bigger house a few years later. 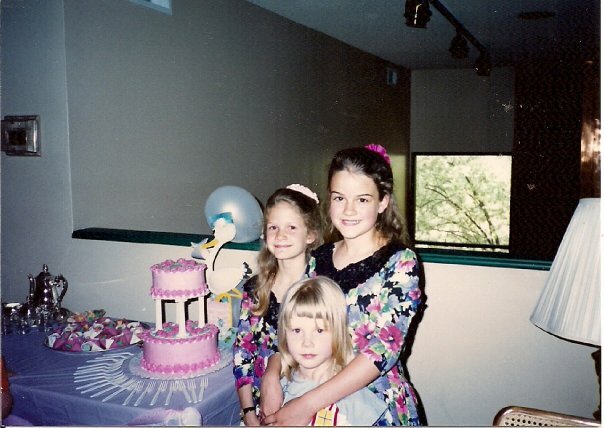 Danielle, me and Lacey at a baby shower. My Mom made the cake on the left. Danielle and I were a little younger than this when we started making the pancake breakfasts. Posted in Breakfast, My Favorites and tagged fluffy buttermilk pancakes. Bookmark the permalink. What a cute story!! You all are so cute!! thank you for sharing such a sweet story. 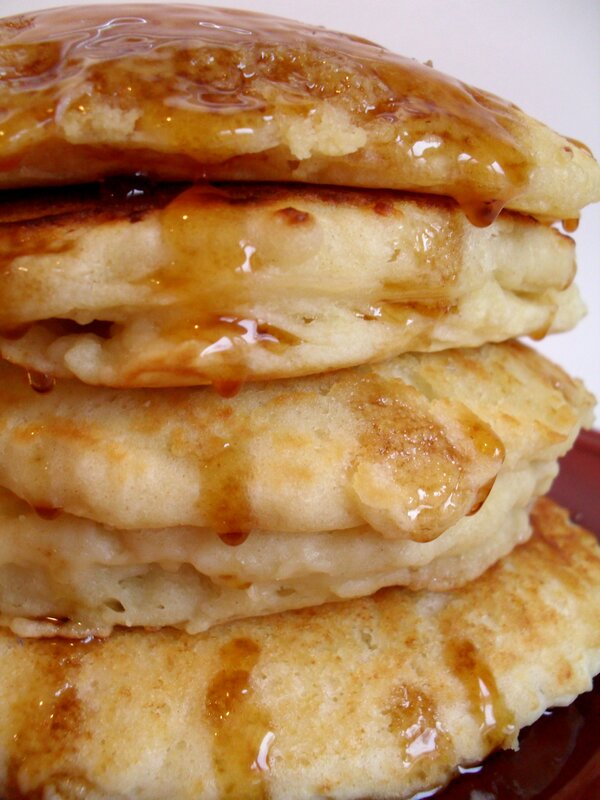 These pancakes look so fluffy. With such a great story behind them, I must make these substitute pancakes soon. Hi, Really nice story and the pancakes look good. I wish I had your pancake skillz–yours were so perfect! Thank you for sharing the recipe and bringing back all those old memories. Seriously that looks like the best thing ever to wake up to! Buttermilk pancakes are amazing as a rule but those are next level!!! I want!! Veronica, this was such a cute little story. Wow, 5 a.m.? You were a dedicated little cook back then! :) Thanks for sharing. I know–now NOTHING can motivate me to get up that early. I found your lovely blog through Real Mom Kitchen. Your pancakes look nice and thick, the way I like them! Have a great day! And backed with such an adorable story too! I have been trying to find a good pancake recipe since I started eating a “Real Food Diet”. I would consider myself to be a pancake snob. I made these this morning and not only did this snob LOVE them, my husband said they were quite possibly the best he has ever eaten! Thank you for your recipe! So glad you both enjoyed them! Yay! PANCAKES!! And holy fluff factor!! Does the 1/4 cup oil go in the batter or is it for the skillet ? Good question-I didn’t make that clear. It goes into the batter and then you’d need extra for the skillet. I was out of my regular store bought mix this morning so found these to whip up instead. So easy and yummy!! I may not buy the mix stuff anymore! I’ve been looking for a specific type of pancake recipe for a long time. 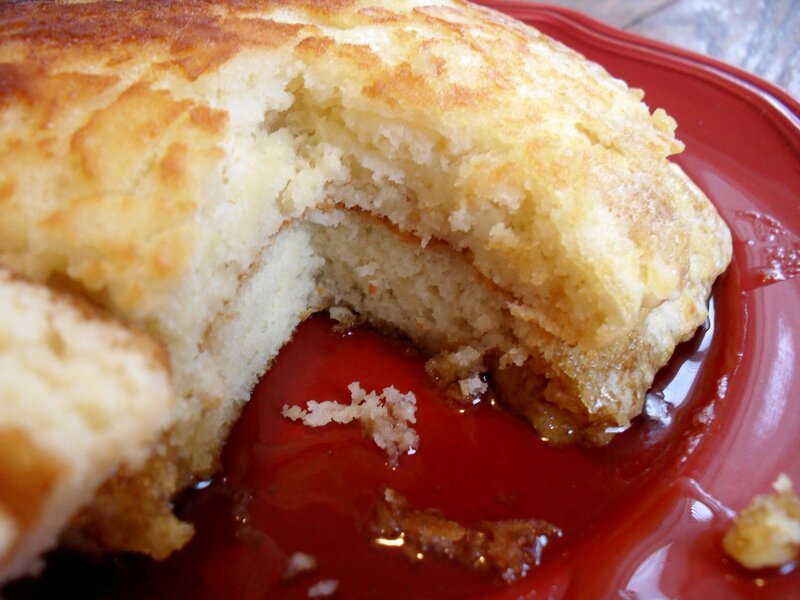 Thick, cakey pancakes with the smallest bit of crust to the edges. I’ve tried many, but they just haven’t made the cut. Thank you very much for taking the time to leave feedback! I’m so glad this one met with your approval. It’s my hubby’s favorite! I think you lived my life. I had a sister and we would do stuff like that. We also have an Old Spice laden Mail-man as our father. He is retired now. That is freaky cool! :D Mine is retired too – he had to retire early after a stroke in 2008 but he’s doing pretty good. OMgosh these pancakes are amazing . Thanks for the share . I also added some vanilla and cinnamon. just got done sunday breakfast with these awesome pancakes and homemade turkey sausage, they we great only thing i did was sift the dry ingredients to make light and fluffy! love your story of your dad! memories to treasure forever!! I love these pancakes! 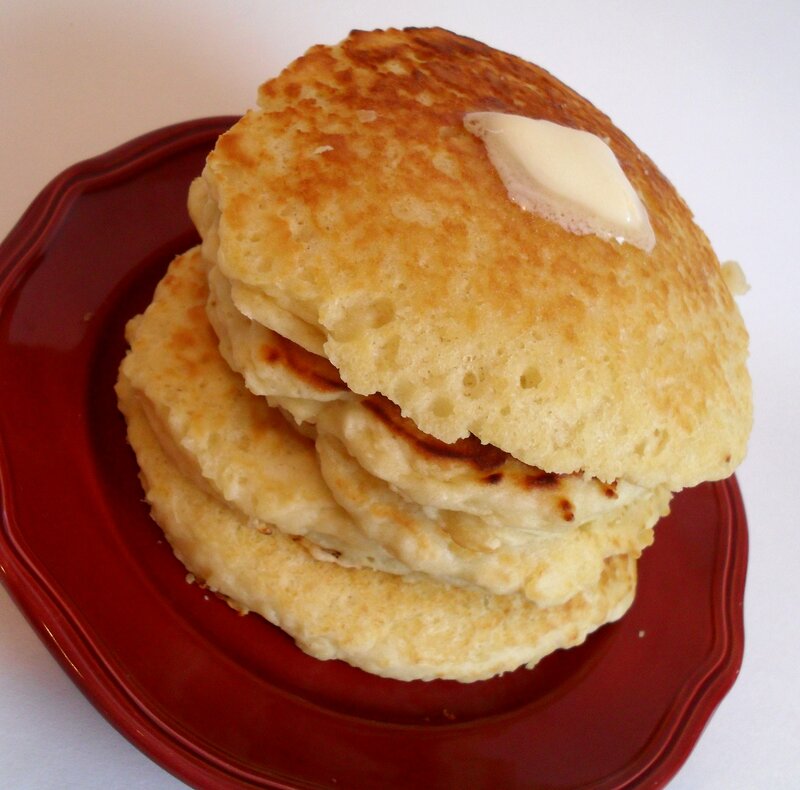 I make them with homemade buttermilk, which makes thrm much fluffier than the store bought. My family loves them! ok i was so looking forward to trying these, as i thought they would be super big and fluffy. i did not yield the same result as you did, unfortunately. they tasted very good and were nice and soft, but too thin. i cooked them, immediately after mixing, 5-10 mins later, an hour later, and even the next morning (24hr later). these are the diff times that i’ve notice people suggest waiting before cooking. i used to same measurements too. so i wonder if i’m under-mixing; i know with cake under-mixing can cause the same prob as over-mixing. so how long should i mix, 30 secs? just enough to incorporate all the ingredients, so 3 turns? or some other amount. i’m tempted to try more baking powder or baking soda, but i want to figure out why i can’t get it right with your recipe. :( maybe my baking soda and powder is too old? i’m hoping between that and the correct mix time i can get the right results. also what do you mix with? a whisk, spoon, or it really doesn’t matter? thanks in advance! Check the expiration date on your baking powder & soda – it’s possible that is the problem, especially if they are expired. Otherwise, my other questions would be are you at a high altitude? Are you using real buttermilk? Are you making any substitutions? As far as mixing goes, basically once the lumps are out, maybe just a little before, stop. I whisk mine, it mixes the batter better than a spoon. I haven’t ever timed how long I mix but it’s probably less than a minute. win!! used better baking soda, plus a pinch more baking powder. also letting it rest a bit before cooking helped. they turned out so great!! i made some immediately, then waited to make the rest. they turned out lovely! but the ones i made later (about 30mins) were even bigger!! glad it worked this time! i almost want to make some more this weekend, but the family might get tired of me making pancakes. oh well, more for me! Yay! So glad to hear you got your fluffy pancake fix finally! I’m having trouble with my pancakes flattening out. What am I doing wrong? Sorry for the slow reply! It could be due to a number of factors but the first thing I’d check is my baking soda. Is it fresh?